Mish's Global Economic Trend Analysis: Can Battery Technology Save GM? Can Battery Technology Save GM? The saga at GM continues. On Monday I spoke of GM's Ridiculous Bluff to raise prices on the 2009 line of autos. GM and GMAC were in the news again on Tuesday on cash burning concerns. Let's take a look. Bloomberg is reporting GMAC's $60 Billion Deal Loses Traction as Cash Burns. Moody's Investors Service cut GMAC's credit rating one level to six rankings below investment-grade last week as ResCap burns through cash after losing $5.3 billion in the past six quarters. Credit-default swap prices give ResCap a 100 percent chance of default within the next five years, based on a JPMorgan model. It was 98 percent before the debt agreement was announced. Separated from the automaker, GMAC's credit rating was supposed to rise from junk, which would have lowered borrowing costs. Instead, the ResCap unit was hit by a cash crunch as subprime home loans started to default. The Minneapolis-based housing unit lost more than $4.3 billion last year, contributing to a $2.3 billion loss for GMAC. ResCap's subprime loans totaled $32.8 billion in March, compared with $36.8 billion at the end of 2007, according to a company filing. GM and Cerebus are both throwing away money on GMAC. Subprime debt is a sinkhole and GM management still cannot seem to figure that out. GM is wasting money it does not have and cannot afford to lose in this bottomless pit. After wasting billions on GMAC, GM May Seek To Borrow $8 Billion. General Motors Corp., the world's largest automaker, may seek to borrow as much as $8 billion as deteriorating sales in North America shrink the company's cash flow, Bank of America said. GM probably will spend $13.9 billion in cash over the next 2 1/2 years, leaving the Detroit-based company with reserves of $10 billion, Douglas Karson, a New York-based analyst at the bank, said yesterday in a note to investors. The carmaker may seek a secured term loan of as much as $6 billion and issue up to $2 billion of bonds convertible into stock, he said. "Pressure is mounting for GM to raise cash," Karson said. "Even though the bank loan market remains very tight, we think that GM has enough unencumbered collateral to successfully issue a secured term loan." GM is going to have to pledge assets as collateral. This is a repeat of the November 2006 play: GM and Ford pledge assets to secure loans. Facing a deep financial crisis, Detroit's two top auto makers have had to pledge some of their most essential assets -- such as factories and equipment -- as collateral to win badly needed new loans. GM, which posted a $10.6 billion loss last year, in July extended a credit line from a syndicate of banks under new terms that give the company a $4.6 billion revolving loan backed by North American assets including inventory, plants and property. On Monday, GM used equipment in some of its U.S. plants to secure a $1.5 billion loan to be arranged by J.P. Morgan Securities Inc. and Credit Suisse Securities. Since secured loans are less expensive than unsecured financing, they are now a more attractive option for GM. The Boston Globe is discussing The Repossession Lane. When lenders sent a tow truck to repossess his silver 2001 Lincoln LS last month, Myles Chilcot eagerly handed over the keys. "I ran around smiling for 20 minutes when they took the car away," Chilcot said. "It was a relief." "The suddenness with which we saw repossessions hit the market at the beginning of the year has been unusual and appears to reflect not only the general economic slowdown, but some spillover from the mortgage crisis," said Tom Kontos, chief economist at Adesa Inc., which runs 58 car auctions across North America. GMAC Financial Services, the country's largest auto-finance operator, late to see the problem is now raising its lending standards. It will be too little too late. Like a junkie, GM and GMAC both need more cash. Again and again, the story is the same. Eventually there will be no more assets to pledge. To raise cash, GM will end up paying a high rate for the loan, and that is even if the lenders like the collateral they receive. The convertible will likely be at a much higher yield. Meanwhile, GM is paying shareholders a dividend rate of 7.3% or so. Borrowing money at 10%+ and paying dividends of 7.3% is simply fiscal incompetence. Citigroup (C) does the same thing, and so do many other financial institutions. Why do they do it? The only possible reason is they think shareholders will dump the stock if they cut the dividend. Well shareholders are dumping the shares anyway. The stock is sitting at $13, and GM is wasting money it does not have on GMAC, still more on dividends, and it is expected to lose $13.9 billion over the next two years. I am willing to bet it will be more than that. Everyone is underestimating how bad this recession is going to be. Unemployment is going to soar. I am sticking with the call I made in Case for an "L" Shaped Recession. Unemployed people do not buy cars, and many will be struggling to make payments on the cars they have. Repossessed SUVs are not going to command a very good price. GM is bleeding cash badly and will continue to bleed cash badly, and at a rate far greater than the industry expects in my opinion. Some people think that GM's battery technology will save it. It won't. It can't. Whatever lead GM has in battery technology (if indeed any), will quickly vanish. Toyota is not standing still. See Toyota's Drive Beyond Oil for more discussion of this idea. 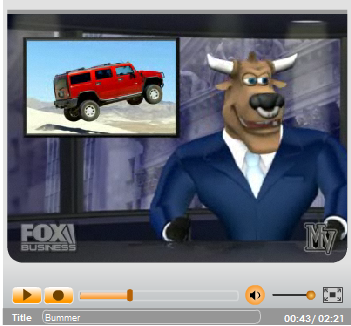 Inquiring minds may wish to consider what Hoofy and Boo have to say about the hummer. SUVs were supposed to be the savior of GM. The Hummer was supposed to be the savior. Now battery technology and the Volt, a car not scheduled to be off the production line until the end of 2010 is supposed to be the savior. Will GM have any cash left then? Will it matter even if it does? The only thing that can save GM is if it can consistently produce cars that people want at a price high enough for GM to make a profit. Nothing else matters, not concept cars, not batteries, not superior technology, not good looks and apple pie. Can GM management deliver? Forgive me for being skeptical, but I doubt it.